← Is MLM a Pyramid Scheme? 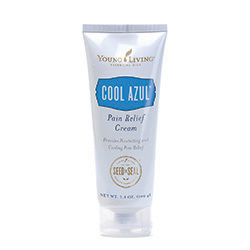 Cool Azul Pain Relief Cream provides P A I N – R E L I E V I N G BENEFITS in two ways—methyl salicylate helps alleviate pain deep in the muscles and joints, while natural menthol provides a cooling effect. Stop using that toxic stuff found in the stores and switch to Cool Azul. Rub it in real good and feel the effects! Ahhhhhhh. So good! You’ll be surprised! This entry was posted in Essential Oil Infused Products and tagged and sprains., arthritis, back pain, bruises, Cool Azul, minor muscle and joint aches, natural pain relief cream, strains, Young Living. Bookmark the permalink.